Congratulations to the Puff n Fluff Pet Spa team on achieving their IPG Certifications!!! Puff n Fluff Pet Spa is the first grooming salon in Georgia to have our groomers and bathers certified by the International Professional Groomers, Inc. In an industry where certification is not required, Puff n Fluff Pet Spa believes it is essential to raise the bar on safety and professionalism by requiring our entire staff to be certified. Thank you Linda Easton, IPG President, for the great educational workshop and seminar last March. 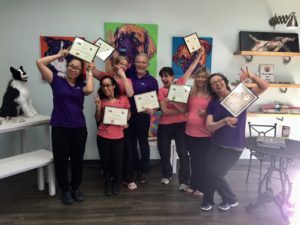 Congratulations to Candice, Lorri, Barbara, and Naoko on achieving their Advanced Certification, to Samantha for completing her Professional Groomer Certification, and to Chris for her Professional Bather Certification! And yes, Kirk received his Professional Salon Certification. Great work everyone and looking forward to continuing our mission of being the best grooming salon in Johns Creek and Alpharetta!